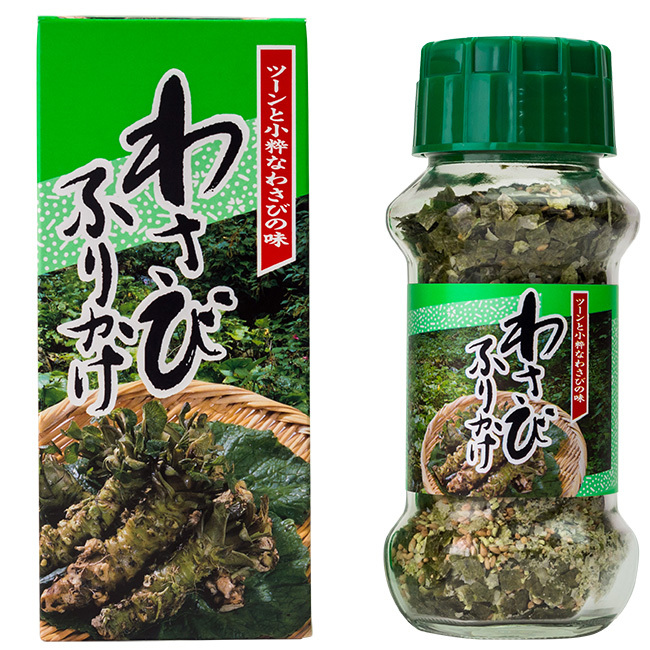 ツーン of the wasabi and hotness to come and a flavor of sesame, the laver are fragrant; is delicious; not finished falling. 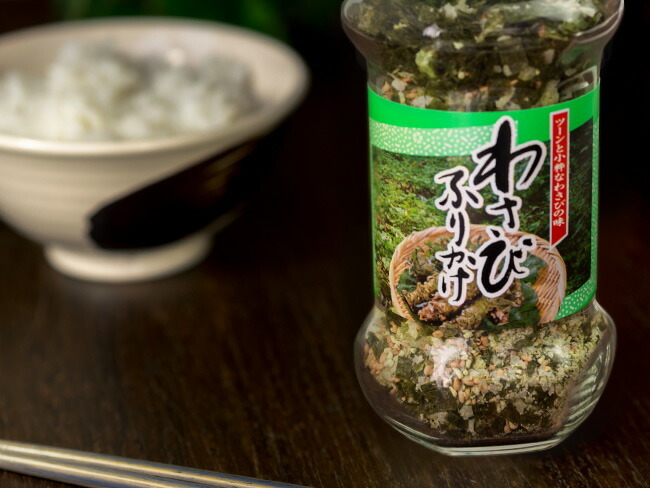 You fully sprinkle it on steaming rice, and please enjoy ツーン of the wasabi and unique flavor to come. 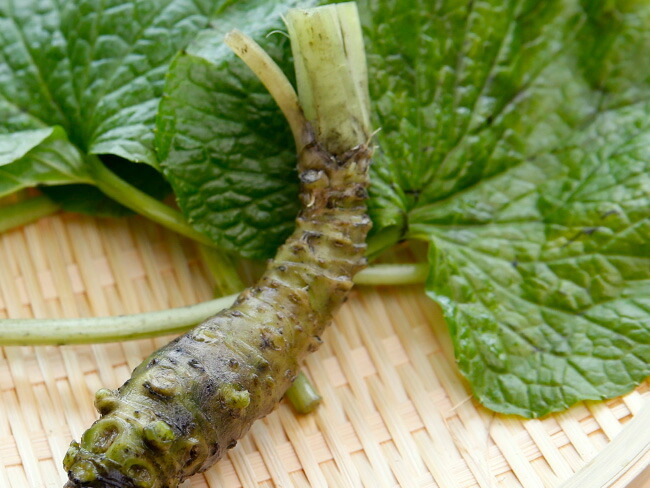 As for the method of the cultivation, there are a water wasabi (valley wasabi, swamp wasabi) to bring up at a mountain stream and a spring and field wasabi (land wasabi) to bring up in a field. Generally, it was spread widely, and it seemed to be from the Edo era that it came to be cultivated, but I was used as medical use in the Nara era, and the use as the spice same as the present age in the Kamakura era seemed to be done. 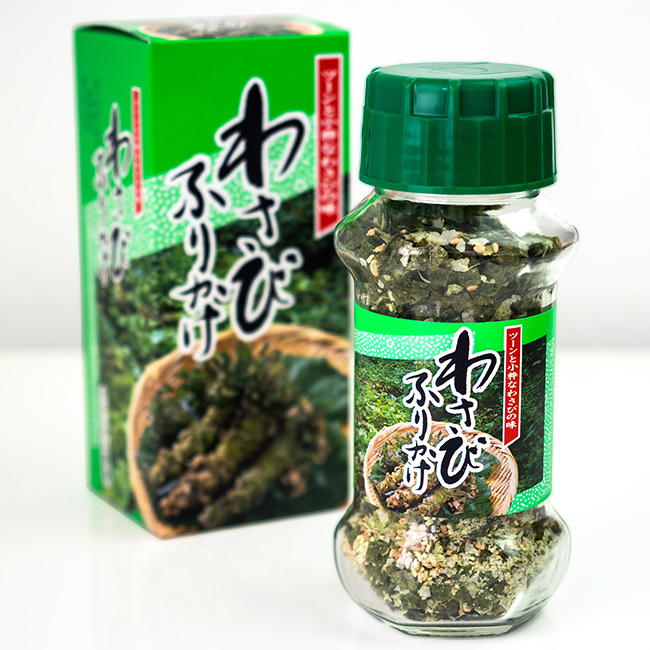 An ingredient is different from the capsaicin which is the pungent component of the red pepper, and there are many crucifers including the mustard, and the pungent component of the wasabi is generated in the process when kind of the mustard oil glucoside to include is grated, and it is said that there is the antibacterial effect. I seem to call it this wasabi to distinguish it from horseradish (mountain wasabi). After all the recommendation is how to use that I do it for a swing to sprinkle to hot rice. 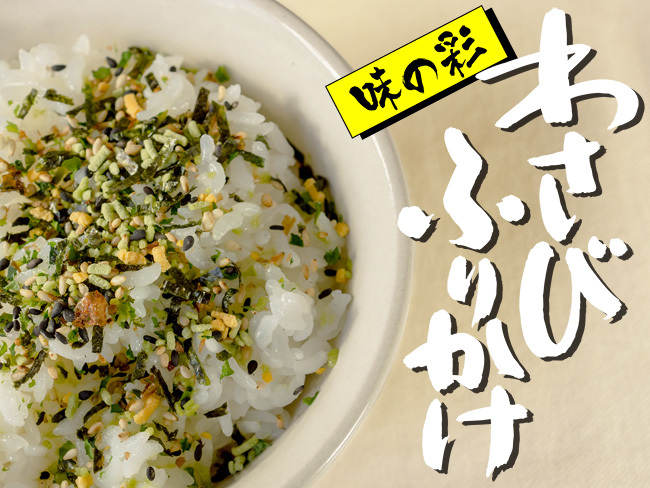 When I run to rice and wait for a while, I am familiar with rice with moisture, and it is more delicious and ツンッ of the wasabi and a sharp taste and a flavor to come are fragrant! A sharp taste peculiar to wasabi becomes the habit; not finished falling. 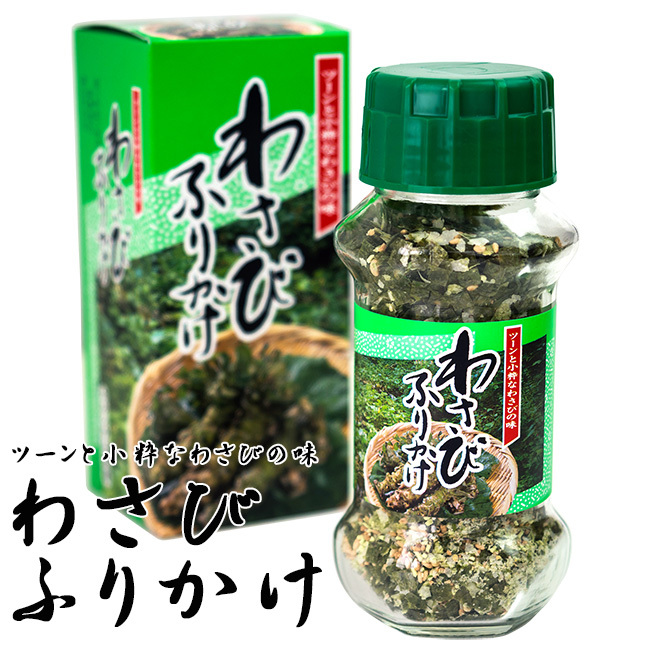 ツーン peculiar to wasabi and the refreshing fragrance and flavor that I did go up when I sprinkle it to the rice that わさびふりかけを is warm. 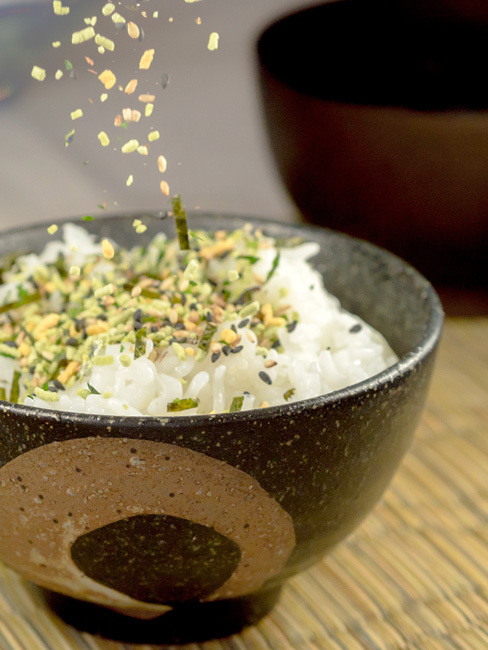 You sprinkle it on warm rice, rice ball, lunch, and please have it. I can have as boiled rice in tea and porridge of rice and vegetables deliciously. 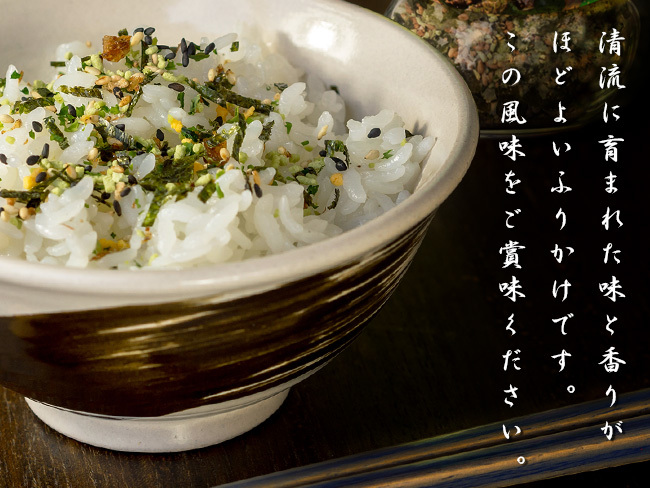 As you match various dishes depending on how to use, please try it by all means! 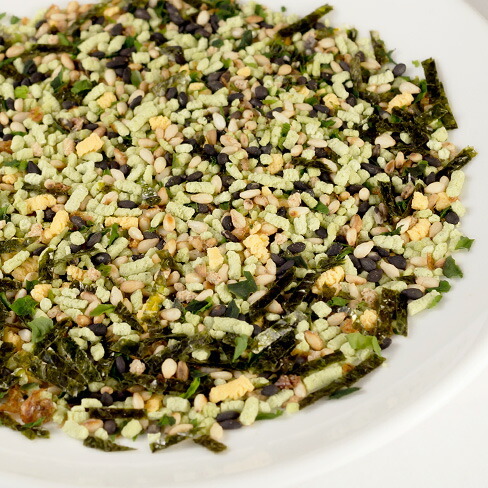 I added sesame, the sea lettuce which were full of flavors to hot wasabi and made depth in taste. The laver which is full of flavors adds to depth of the taste and is a taste hard to quit after starting just carelessly. 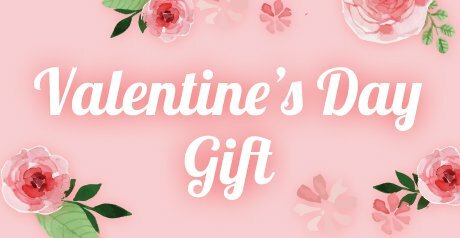 It is recommended in the which is wide from a person loving wasabi to the person whom I am slightly hard for to deal with. I blend sesame, laver and, as well as wasabi, raise a flavor. ツンッ of the wasabi and flavor to come spread to fill the mouth when I eat, and a mouthful is unbearable, and it is appetizing! ツーン peculiar to wasabi and the sense that I did, please appreciate habit になるふりかけをご. ツーン of the wasabi and hotness to come and a flavor of sesame, the laver are fragrant; is delicious; not finished falling. 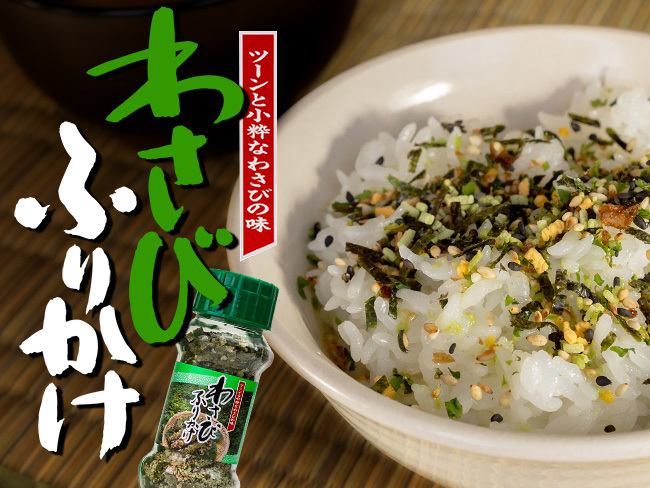 You fully sprinkle it on steaming rice, and please enjoy ツーン of the wasabi and unique flavor to come. Generally, it was spread widely, and it seemed to be from the Edo era that it came to be cultivated, but I was used as medical use in the Nara era, and the use as the spice same as the present age in the Kamakura era seemed to be done. An ingredient is different from the capsaicin which is the pungent component of the red pepper, and there are many crucifers including the mustard, and the pungent component of the wasabi is generated in the process when kind of the mustard oil glucoside to include is grated, and it is said that there is the antibacterial effect. I seem to call it this wasabi to distinguish it from horseradish (mountain wasabi). 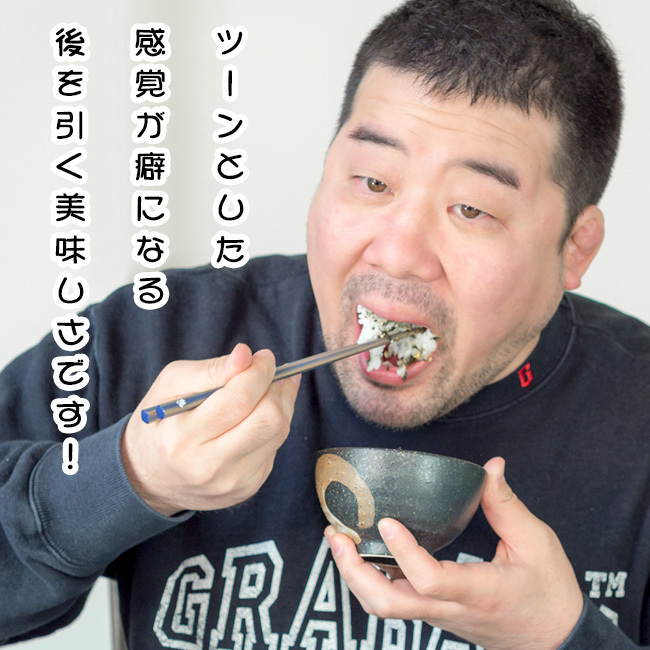 ツーン peculiar to wasabi and the refreshing fragrance and flavor that I did go up when I sprinkle it to the rice that わさびふりかけを is warm. 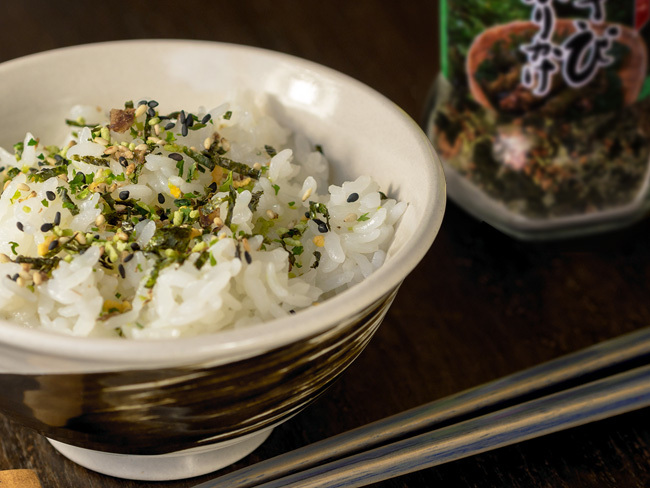 You sprinkle it on warm rice, rice ball, lunch, and please have it. I can have as boiled rice in tea and porridge of rice and vegetables deliciously. 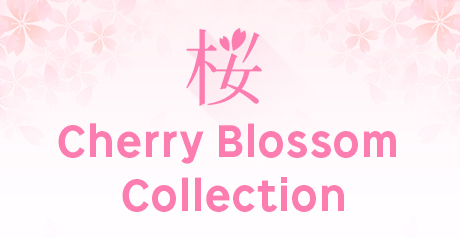 As you match various dishes depending on how to use, please try it by all means! I added sesame, the sea lettuce which were full of flavors to hot wasabi and made depth in taste. The laver which is full of flavors adds to depth of the taste and is a taste hard to quit after starting just carelessly. It is recommended in the which is wide from a person loving wasabi to the person whom I am slightly hard for to deal with. A preservation method: Tear direct rays of the sun, and please save it in the as possible dry place. You close a cap and a cover after opening by all means and keep it, and please have it early.